← Banks and numerical literacy? Turing’s remarkable career was marked by happenstance. In 1936, when he was a student at Cambridge, he attended a lecture in which M.H.A. “Max” Newman characterized an old and thorny logic problem as a matter of finding a “mechanical process” for testing the validity of a mathematical assertion. Turing took the phrase “mechanical process” at face value and wrote a paper in which he laid out the architecture of a hypothetical machine to do the testing — what became known as the “Turing machine.” The paper, intended for specialists, amounted to a blueprint for the modern computer, a “universal machine” that could do the work of an infinity of single-use machines. 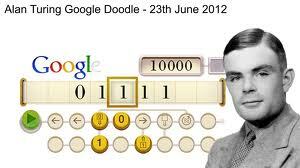 Alan Turing is known for many extraordinary feats. He was the one who cracked the German Enigma code, by developing a machine (a quasi-computer) who could defeat the corresponding German machine (the Enigma) which encoded top-secret messages from Berlin headquarters to U-Boots around the world. As Leavitt says, he was the only who thought a machine could ever defeat another machine. This result, which eluded British, US and Polish mathematicians, could well have changed the course of the war. Not only. He was the one with the vision of an Artificial Intelligence. With his seminal paper Computing Machinery and Intelligence (Mind, 59, 1950) he opened the field of AI from scratch and provided an intelligence test instrument (the Turing Test) which, if somehow naive –after all, he thought of it well in advance of computers being built and used– has never been won by a machine, yet. But he is most important because he defined –again, without the computer– the computer itself and the whole of computer science, providing a simple, elegant and mathematically sound model of a computer, the so-called Turing Machine. A Machine, universal in scope, which can “compute” whatever is “computable”: a Machine which, in a few words, can compute what a supercomputer of today can compute. This result is extraordinary, for Turing showed that no matter the power and the technology, his abstract Machine could compute all and the same things that whatever other machine could, no matter how powerful. At the same time, Turing also worked out the inverse proposition: There are intrinsic limitations on what can be computed, which cannot be eluded. His Halting Problem is a masterpiece of elegance and beauty and shows how little-powered is human thought. Suppose in fact that you got a nice program for a computer, Turing said. It could be a ten-line program or a ten-million-line one (for instance, Microsoft Word). It would be great if one, by inspection and analysis, were able to see if that program eventually stopped. Because a non-stopping program is unsafe and unusable (except those which are made that way ad hoc, like Operating Systems). Certainly Bill Gates would pay me handsomely if I came out with one. Well, Turing showed that this is not the case. We cannot build a machine which can inspect a program and tell us if it will eventually stop or not. It is called an undecidability problem. Its beauty lies in the fact that it is fully independent of technology: neither can we overcome this limitation with the best and fastest supercomputers or grids or whatever; and neither can hypothetical Andromedans with a technology a billion-year more advanced than ours. In 1952, he was convicted of “gross indecency” – in effect, tried for being gay. His sentence – and he was faced with the miserable choice of this or prison – was chemical castration by a series of injections of female hormones. He took his own life just two years later. Only recently has Britain’s Gordon Brown issued a statement of official excuse: Gordon Brown: I’m proud to say sorry to a real war hero. His are the words above. Alan Turing is at last getting the recognition he deserves, as a genius who changed the world forever –without the world taking care to note–. The memory of what was done to him must remain strong, though, for such monstrosities are inflicted upon human beings out of ignorance and prejudice. 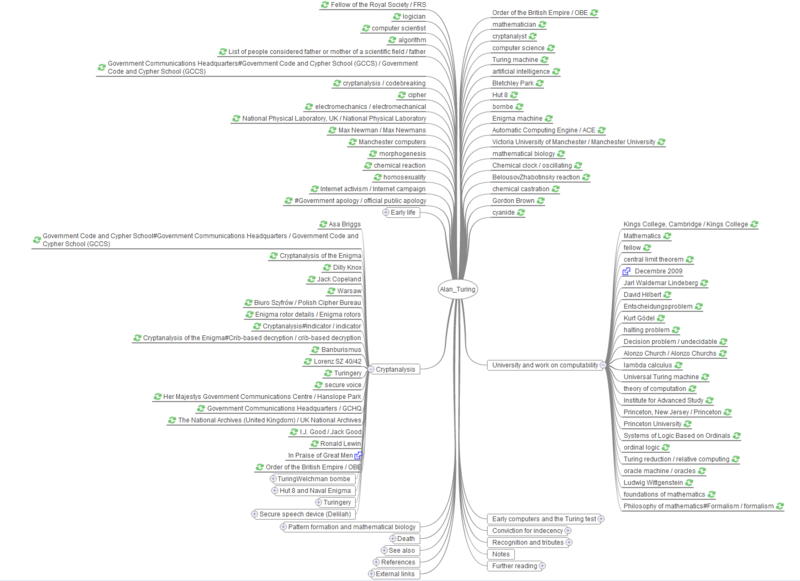 Here is a WikiMindMap of Alan Turing from Wikipedia. David Leavitt wrote a nice biography: The Man Who Knew Too Much: Alan Turing and the Invention of the Computer, available on Amazon. This entry was posted in computing, education, general and tagged computing, education. Bookmark the permalink.